When looking at places to travel in the Caribbean, you have a lot of options: the Bahamas, the Dominican Republic, Jamaica, Puerto Rico or any number of smaller islands further south. But two of my college friends and I ended up in the Cayman Islands partly because it sounded super exotic and partly because it was a reasonably priced flight from Florida where one of them lives. This was officially the first tropical beach vacation I've ever taken and I tried not to over plan so we could legit just relax. We didn't go in with many expectations about Cayman...all we wanted was white sand, blue water and tropical drinks. However, we were surprised at how developed the entire island of Grand Cayman is with their perfectly paved roads and their own hit music radio stations, as well as how amazingly nice the people are. Seriously, I must be jaded from living in Chicago my whole life but everyone we ran into was honestly so kind and helpful, from the gas station attendants to just people walking past you on the street. All of this led to a wonderful four day vacation. The Cayman Islands are made up of three islands: Grand Cayman, the largest and a very popular cruise ship destination, Cayman Brac and Little Cayman. We spent all our time on Grand Cayman since the other two are remote and more suited for scuba divers and avid snorkelers. Grand Cayman is SMALL. Often when you look at a map of nearby Cuba and Jamaica, you can't even see Grand Cayman; it's just a little spec in the middle of the ocean. Despite it's size, there is actually a lot to do! We traveled during a tropical storm (lucky us!) and encountered a lot of rain and overcast skies on our trip (so much for that relaxing beach vacay, right?) but we still found many activities and adventures to fill our four days off from the real world. If there is one thing I could recommend over anything else when visiting Grand Cayman, it would be to rent a car. It's so affordable; our little lime green Kia Picanto cost about $100 total for the whole trip. Plus with a car, you can really check out every nook and cranny of the island. Having a car gave us so much flexibility and freedom while also testing our wits quite a bit. Being a British territory, the people of Cayman drive on the left side of the road. Flipping our driving orientation was a first for all of us. Add on top of that the fact that there are only 8 stoplights on the island and every other intersection is a roundabout, our first day of driving became quite an adventure. I played navigator the entire trip directing how far to turn in each roundabout and which exit to take, all while helping to avoid large crabs or chickens crossing in front of us on the road. 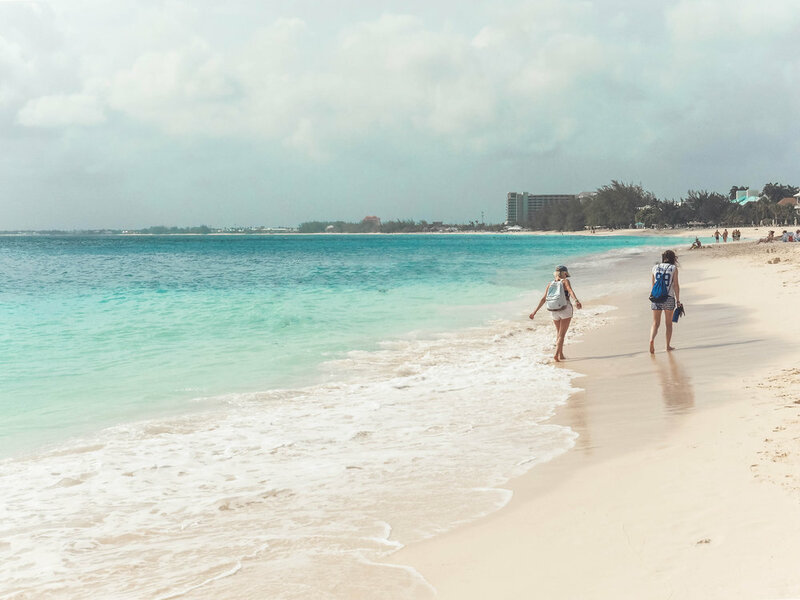 When planning your Cayman vacation, you'll find that most activities are located on the West End of the island, closer to the airport. However, it's worth it to stay further away from the hustle and bustle for more affordable lodging and easier access to everywhere else. We chose to stay in an Air BNB in Bodden Town along the south coast of the island, which meant we were never more than a 40 minute drive from anywhere, with most places being an average 20 minutes away by car. Bodden Town is the former capital of the island and far less touristy as it's become a booming area for local residents to live. 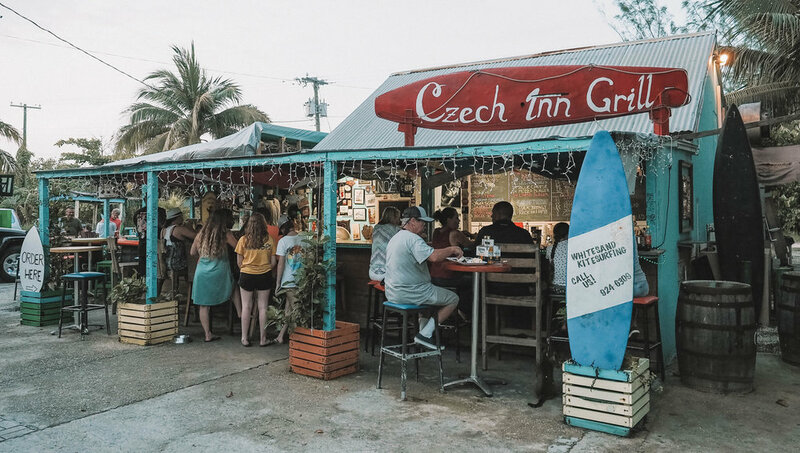 Bodden Town is home to some great restaurants filled with local flavors and vibes, the most memorable being the Czech Inn Grill. Just down the street from our Air BNB, Czech Inn Grill is the epitome of a chill beach vacation restaurant. 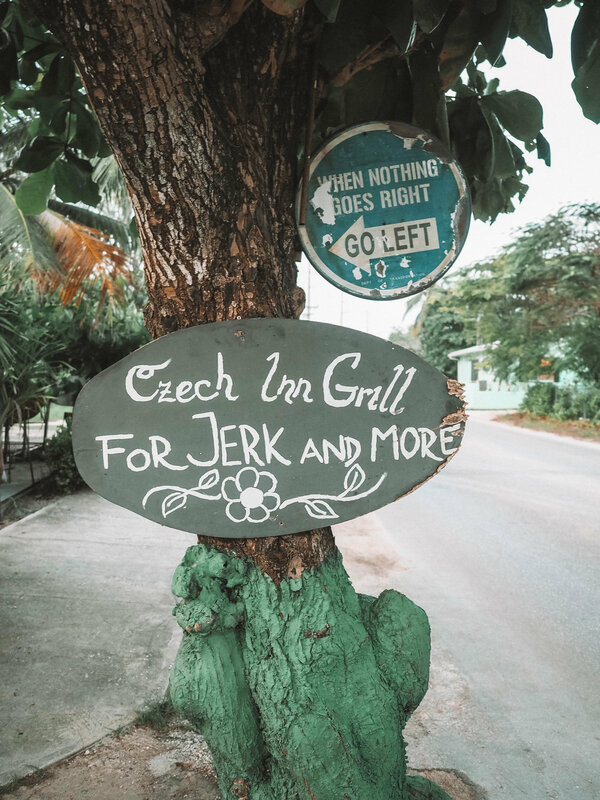 Located on the side of the main road through Bodden Town (a small two-lane road) it's unassuming and not at all pretentious, serving local favorites like jerk chicken in fun ways like burgers and quesadillas, plus it's probably the only place on the island to get schnitzel. The owner is actually Czech and he'll talk you ear off about hockey and the NHL. Open late into the night, you can chill under twinkle lights with a cold beer from the liquor store next door (with the greatest name ever: Water Boyz) in the warm Cayman air, forgetting that in a few days you'll be back to your normal life. 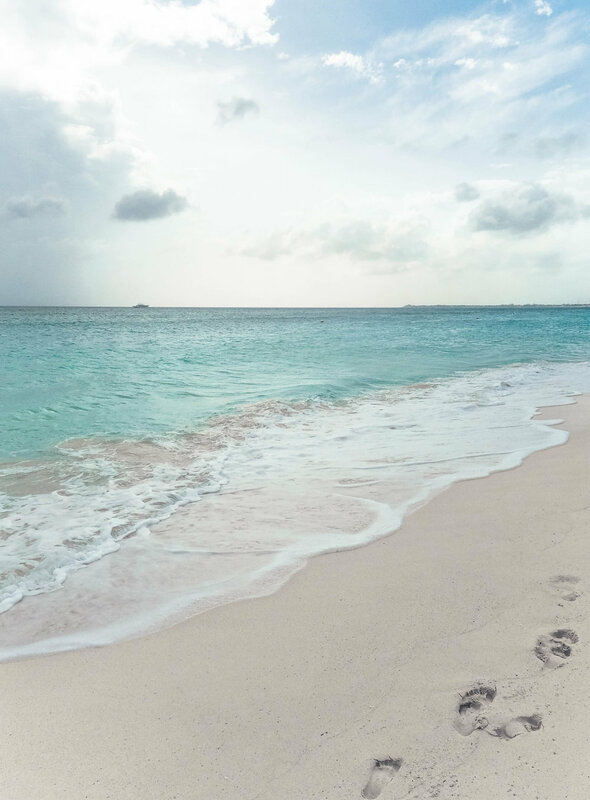 Seven Mile Beach is the gem of the Cayman Islands and it's the answer to all of your tropical beach vacation dreams. Consistently rated as one of the best beaches in the Caribbean and making many lists as one of the best beaches in the world, SMB spans across (you guessed it) seven miles and is dotted with lower tier hotels to high end resorts like the Ritz Carlton along it's stretch. Governor's Beach is the free section of Seven Mile Beach where you don't have to be staying at a resort to enjoy. From there you can walk the water's edge and stop at hotel restaurants and pool-side bars along the way for bites and drinks. The water in the Caymans is everything you would expect. Even with overcast skies it was the most beautiful ombre shades of blue and turquoise that I've ever seen. Every time I even glanced at the ocean, I felt like I was staring at a postcard or a very well filtered instagram photo. It was pretty darn entrancing. Although Seven Mile Beach is the place to be, there are other less crowded beaches across the island as well. You're sure to find you're perfect R&R spot easily. Sometime you need a little adventure in between your pina coladas. Hands down the BEST thing you can do in the Cayman Islands is take a boat charter out to Stingray City, a sandbar in the ocean where you can feed and be surrounded by dozens of wild southern rays that will swim right up to you. It's by far the coolest animal encounter I've ever had...and I worked/volunteered at a zoo for 12 years! Most charters will continue on for a snorkeling stop and a break at Starfish Point as well. Learn more about this amazing excursion HERE. Who doesn't love turtles? When I was a kid all I wanted for a pet was a yellow lab and a turtle...not too much to ask! (even though I never got either). The Cayman Turtle Farm is a conservation center for Green Sea Turtles on the north end of West Bay, just north of Seven Mile Beach. Since the Green Sea Turtle is endangered, the Cayman Turtle Farm raises turtles for consumption on the island in order to not deplete the wild turtle population any further, and assists in reintegrating turtles back into the wild. A small admission fee will let you check out pools of MASSIVE sea turtles as well as give you the chance to hold younger ones. Plus they have tiny baby seas turtles in their hatchery! It's a fun stop that's relatively quick to walk through and a great side trip once you've built up your beach tan. 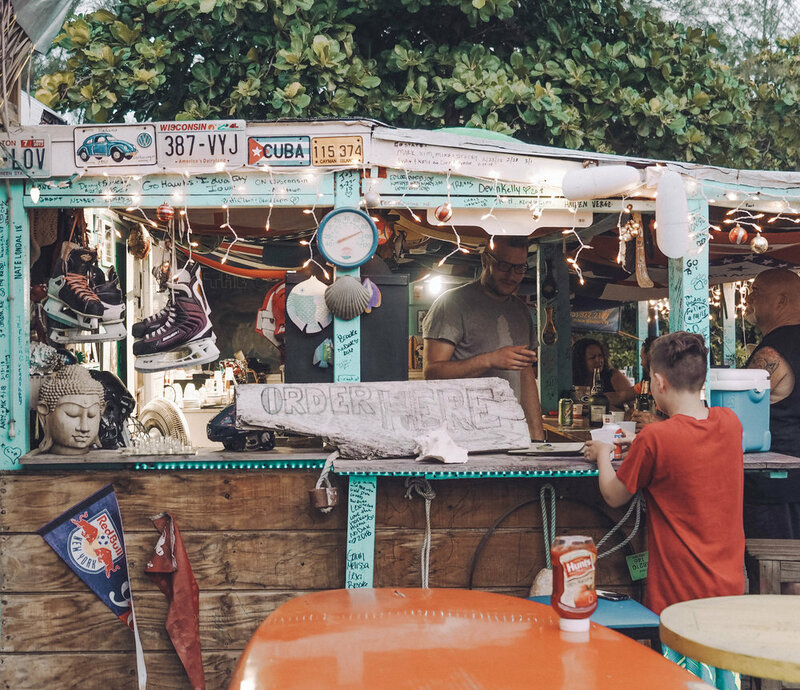 After hanging with turtles, head up the road for a meal at Macabuca, the outside bar and restaurant that's a part of the Cracked Conch. Make sure you order the conch fritters and have a tropical drink which relaxing next to the waves hitting the rocky shore. 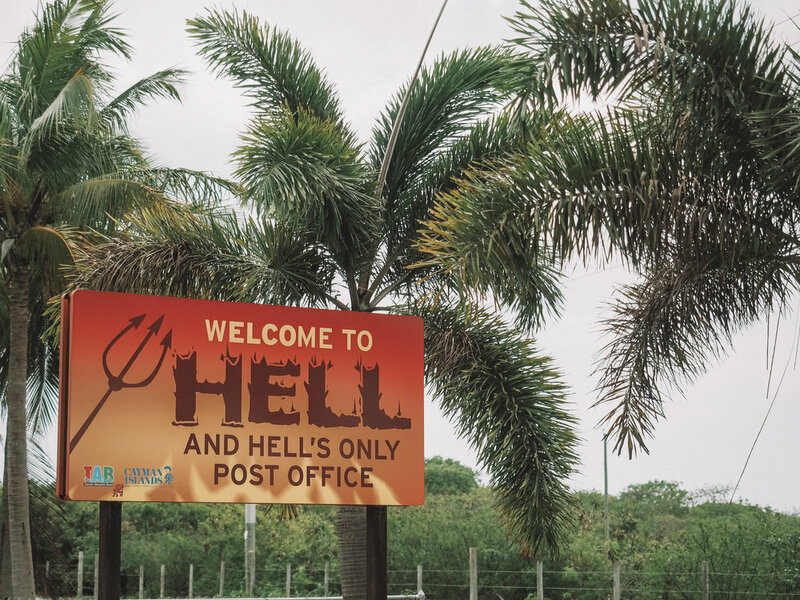 Just east of the Cayman Turtle Farm is a small little town with the not so fortunate name of Hell. 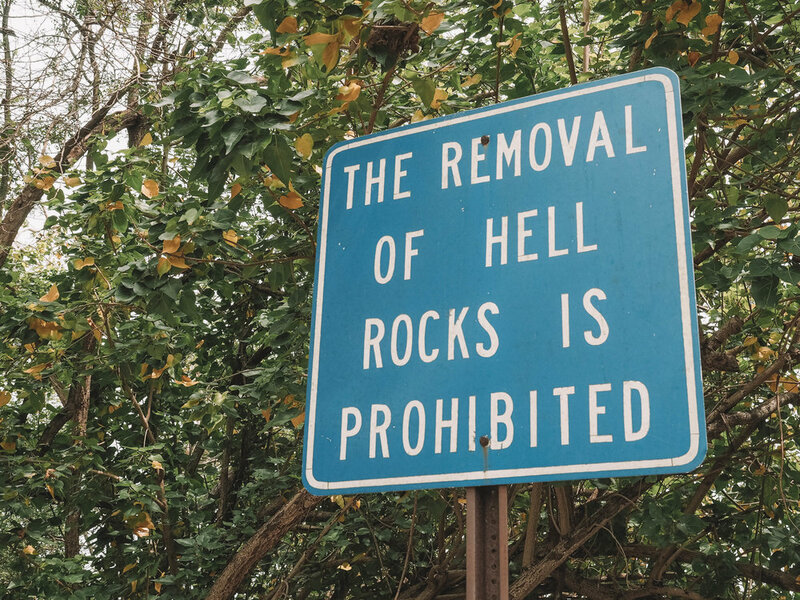 It may be a little bit of a tourist trap and a lot a bit of kitcsh but let me tell ya, it's really amusing to tell people you've been to Hell. You can even swing by the souvenir shop and get your passport stamped from Hell. 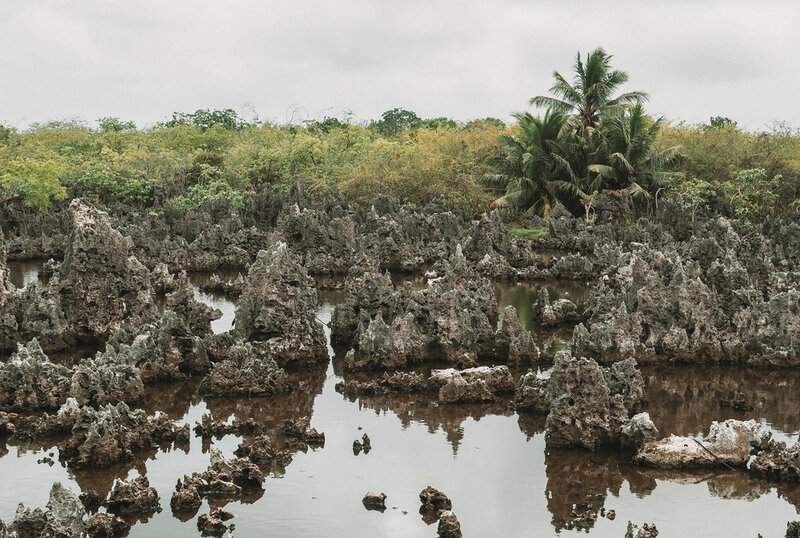 There are many rumors of how the town was blessed with its namesake but the most popular is when you see the natural phenomena behind "Hell's only post office": the short limestone rock formations that stick out of a shallow body of water, which really do look like a scene pulled from Dante's Inferno. We were given a personal tour of the limestone scenery by a sweet, local Cayman woman who helped us spot the many iguanas camouflaging against the formations. There's something special about having a car and being able to venture out to the sides of the island that the cruise-shippers don't have access to, especially since some days those ships can bring upwards of 10,000 additional tourists in one day to Grand Cayman. 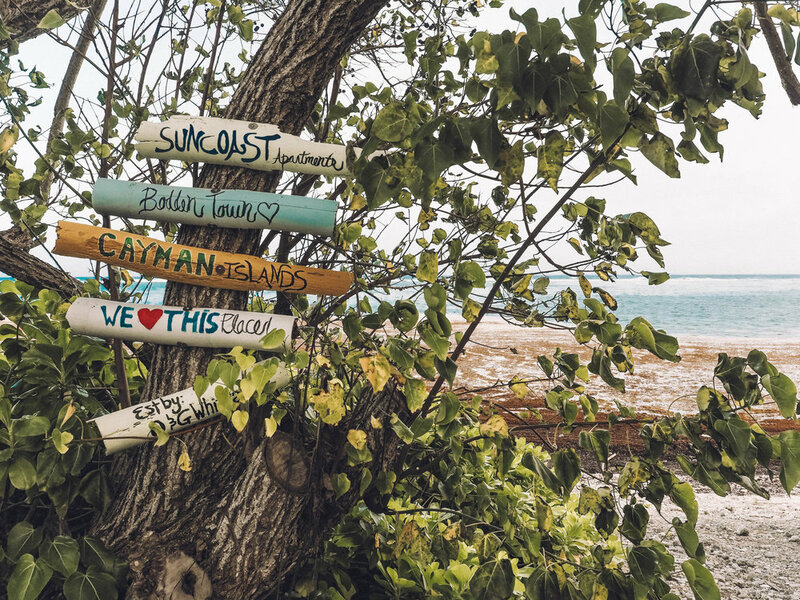 You can spend time in more local restaurants and chill at far less crowded beaches just by driving 15- 20 minutes away from Seven Mile Beach. The east side of the island is known as East End and is where many divers stay to be closer to the awesome shipwrecks offshore. We drove out to the East End for lunch at Tukka, a beach-side restaurant with a shaded patio where you can try an appetizer sampler of iguana three ways or eat a local staple: lion fish tacos. Lion fish are an invasive species so many restaurants cook them up in fun ways in order to keep the population down. Tukka also provides a great view point of the Wreck of the Ten Sails. As the story goes, British merchants ships crashed along the rocky ocean bottom some 220 years ago while returning to Britain from Jamaica. 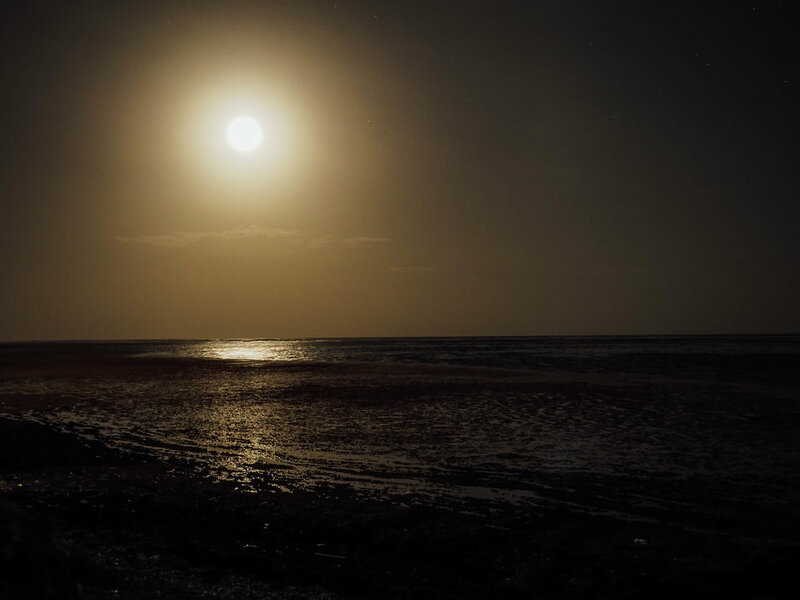 It is said that the natives of East End made sure no lives were lost as the ships went down and in return, Cayman was granted tax exemption status by the British king. From the Tukka patio, you can see the remnants of those 10 ships sticking of of the ocean along the horizon. Rum Point is another great stop while vacationing to Grand Cayman. Located long the Northern tip of the island, it's a section of beautiful beach with live music, restaurants and fancier houses nearby. 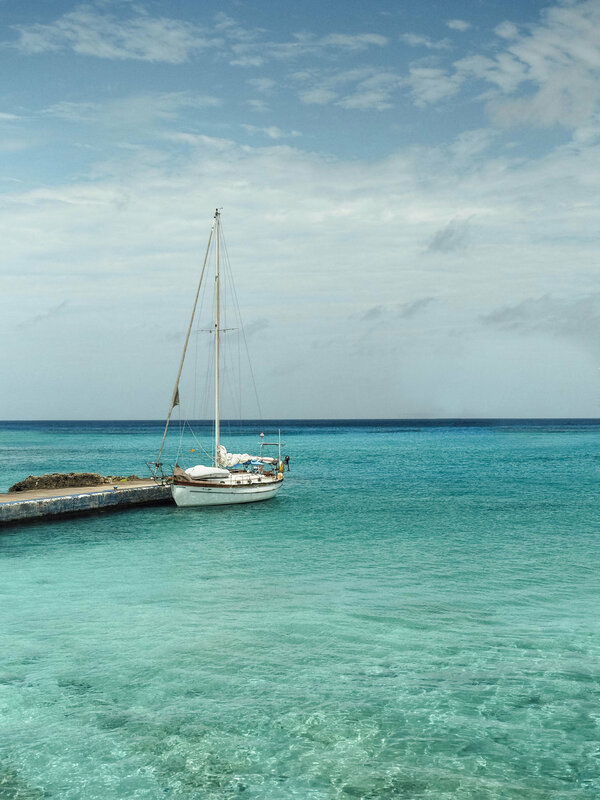 I've heard that the people who take annual vacations to Cayman are the ones that frequent Rum Point. 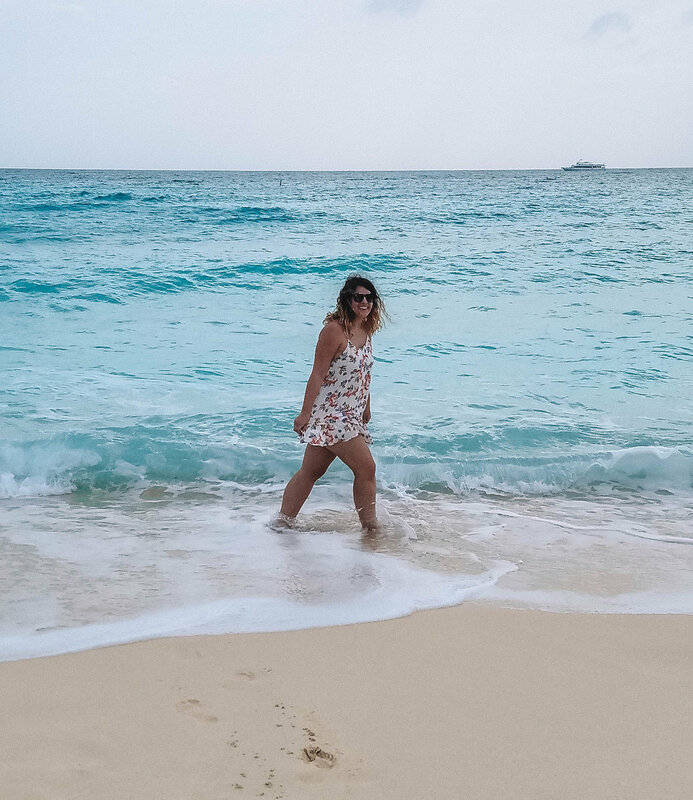 We had an amazing time in Grand Cayman and even with bad weather, we still had a decent amount of sun and I returned to the Midwest with a tan. The Caymans are a great place to really experience sea life up close and personal and enjoy the island lifestyle. I'd love to take the time to explore more of the Caribbean to see how it compares but for now, Cayman is a lasting memory.